Most lunch breaks I take a walk down through our field. The grasses are measurably taller against my legs, and the new families of hoppers are now big and bouncy enough to spring board into the backs of my wellies, and even the turn-ups on my shorts. There are daubs of Clover and Birdsfoot Trefoil; rambling outbreaks of Lesser Stitchwort have spread like earthbound constellations. Large shifting islands of Yellow Rattle have appeared, and I’m easily distracted by the swelling patches of Mallow leaf that promise plump cushions of pink. Short spears of Bugle are beginning to draw the eye of Marbled Whites and Meadow Browns, while spiders can be seen with one foot always resting on the edge of their trampoline larders, poised for the vibrations of an unlucky prey. For the first time ever, this year there’s the joyful cascade of bubbling chatter from skylarks! Never in my wildest dreams would I have thought we’d be blessed with such a glorious choir. Since planting out this year’s young and vulnerable seedlings, I’ve been making regular trips to my veg garden. I’m jangly with the anticipation of the new, the taller, the flowering and the almost fruiting. There’s also a palpable edge of dread. Often I find signs of visitors… the odd pheasant feather amongst the broadbeans, a silvered and neatly scalloped edge of a courgette leaf. But more recently I’ve been finding the occasional, oversized ‘mulberry’ of deer poo. We’ve done as much as is possible to at least guarantee some harvest, but it seems that over the last decade, each new generation of veg plot reveller has been gifted the genetic imprint of a map of this ‘free and full’ larder, and so my planting and protecting has had to become more strategic. Corn (a favourite) is bedded in beneath the cloak of a nut tree and the broad beans will be netted. Onions and garlic will always be the crops nearest the field side fencing as deer (and pretty much every other prospective diner) don’t much care for aliums. I love broad beans… they make me smile. 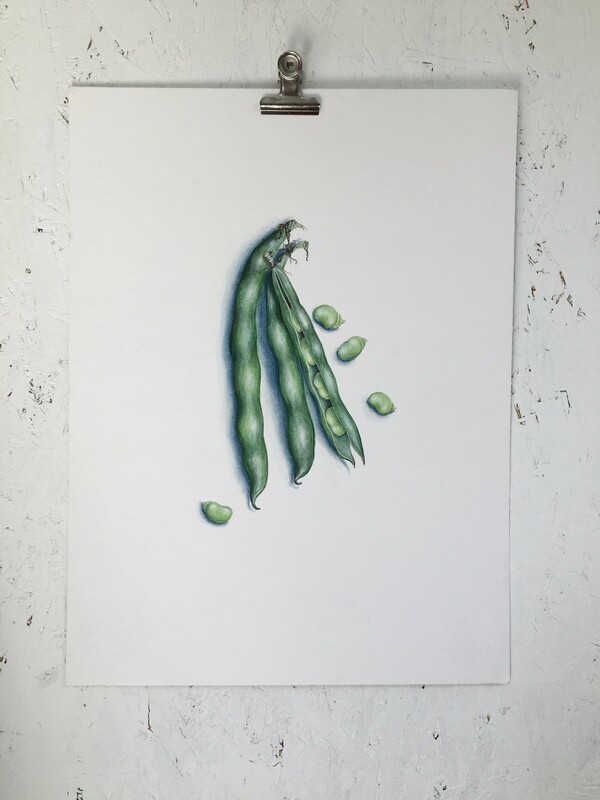 They’re such a generous vegetable, giving pleasure throughout the whole process from the twist, twist n pick of the plump and green torpedo, to the slip of the thumb and the slow reveal of the soft velveteen nursery within; a row of smooth skinned cherubs, tiny umbilical cords slowly plumping up these happy beans. The choice of whether to peel once cooked: I love them both ways… that kidney-bitter skin is a rewarding contrast to the butter rich green of the bean within… I love them in a risotto, and adore them with a crumble of cheese and some wild rocket (perhaps some fried off pancetta stirred through). 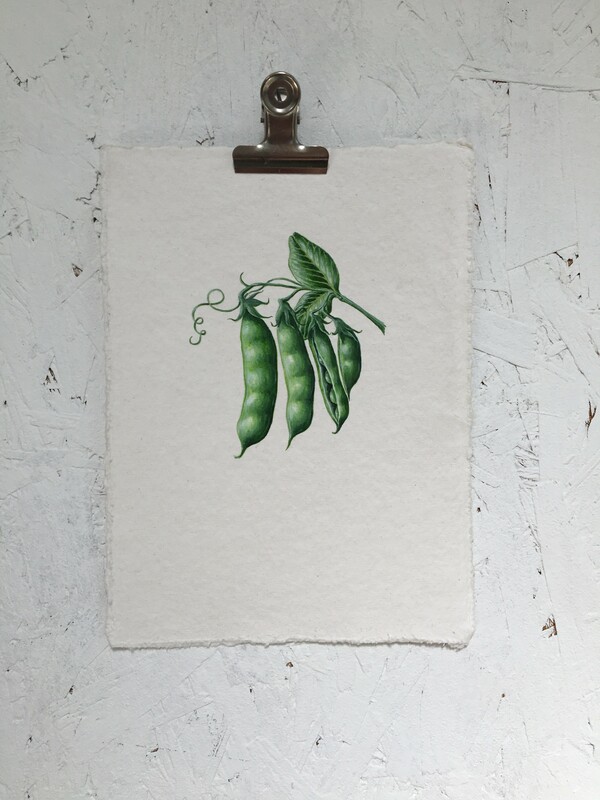 Over the years, I’ve illustrated many podded vegetables, but have never felt entirely able to capture that freshness on paper. 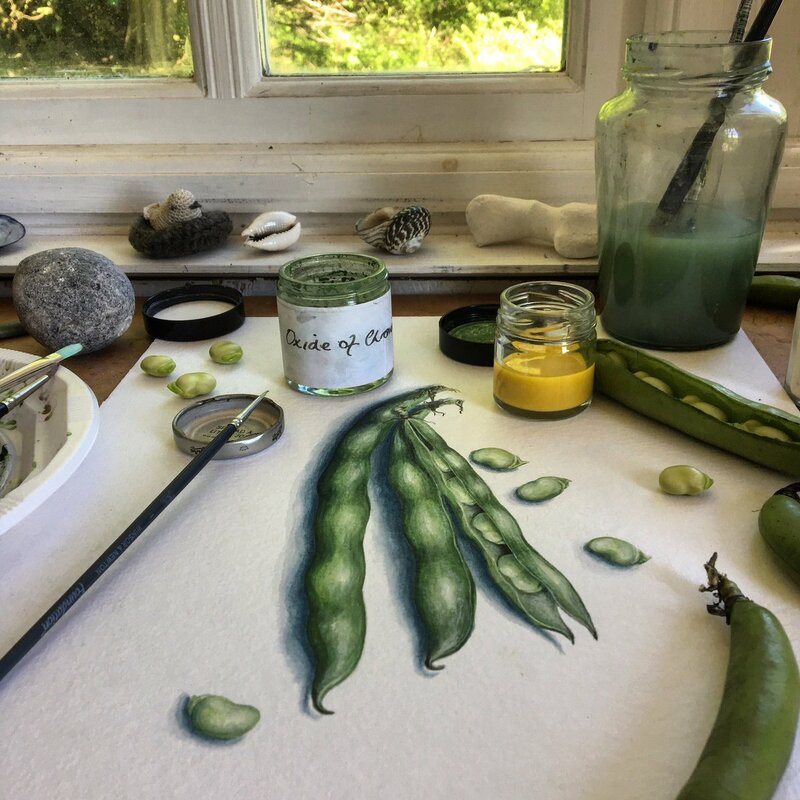 So having learnt to work with egg tempera, I decided that this might be the way to go, to mirror their depth of plush colour and form, and that undeniable sense of treasure revealed. Of all the powdered pigments that nestle in the dark recesses of my studio drawers, Oxide of Chromium and Genuine Naples Yellow are the very essence of Summer. Dipping a licked-to-a-point brush into egg, then into powder, stirring on white porcelain to blend, then stroking across thick cartridge. There’s a deep and rich melody that plays out in my heart as I work the layers of tempera to create the shape and shadow of the split pod. The studio window is open most of the time now, any loose papers are anchored with a ball of flint or a slab of slate. The parenting blackbirds are too busy, too tired no doubt, to argue over curtilage rights, so for once there’s just the sound of a breeze cuffing at the sea of bracken outside. If you’d like to know about my work, then do get in touch. I’m always happy to have a chat. And for those of you who’d like to have a go at painting in egg tempera, then I’m delighted to say that I’m running a couple of courses in September! One is due to be held at the gorgeous Otter Farm, and the other at the very beautiful Thyme. If you’re interested, then do get in touch with them to find out more. They’re truly inspiring places and it would be very lovely to see you there! Meanwhile, for more egg tempera illustrations in amongst other work, head over to instagram.